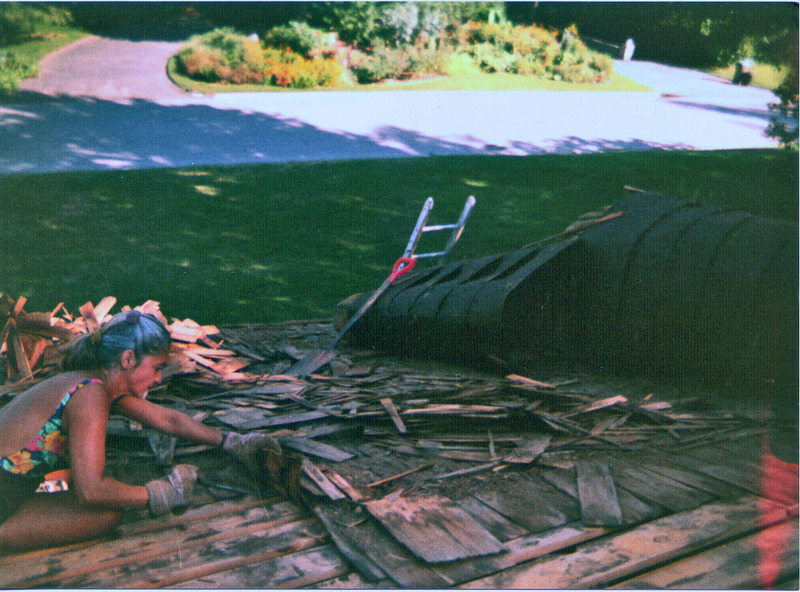 My job was to pull the old shingles and remove the tar paper underneath. Each shingle revealed an army of spiders running away in panic. A panic at first closely matched by my own, but within a couple of hours I barely even noticed them. A considerable amount of Aleve and sunscreen were consumed during those summer months, in which me, Phil, and his twin sons worked very very hard under the intense Oklahoman sun. 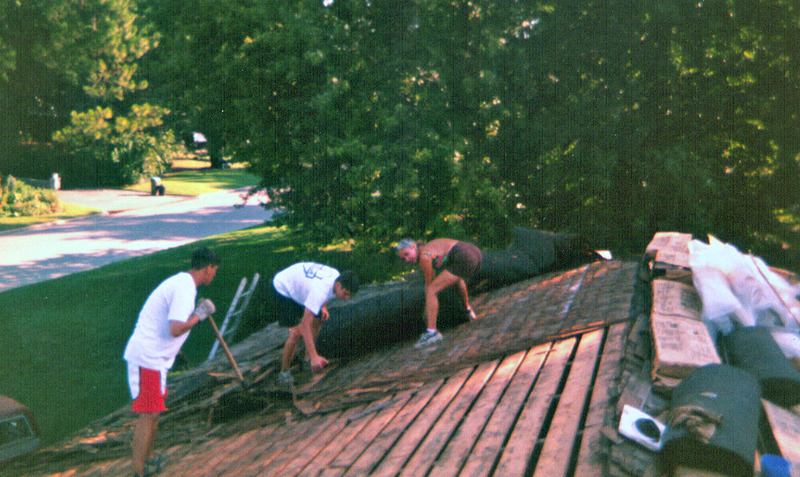 Phil installed the new, gorgeous roof, and I helped him roll out the new tar paper, and nail it in place. The evening after we finished the job, as we crashed on the sofa, absolutely exhausted, he popped the question “Will you marry me”? Congrats, and wishing you many more sets of blissful 12 years! We’ll be celebrating 42 very happy years today, Yikes! Where does the time go? Enjoy! WOW! 42 years today! So we are “just” 30 behind…. Happy Anniversary, Jim! I am sure you will have a fantastic day! Happy anniversary Sally. You make a handsome couple. Congratulations Sally, now dig out one of those little black dresses and celebrate! Yeah, we have a ton of photos together, it wasn’t easy to pick some, but I tried to choose the ones Phil likes, and he can be very picky for photos. My favorite is the one in Paris, 2010, our 10th year anniversary celebration, sitting in front of Les Deux Magots, our favorite cafe in town. I love that photo, it was a gorgeous day, with blue skies, and we were absolutely in heaven! What a nice post. Boy are you guys home bodies though, ha. Kidding. It’s nice to see the world with someone you love. You know, Greg, even though we traveled a lot (often for work related stuff), there’s nothing I love more than staying home. Seriously. Happy Anniversary, Sally and Phil! You and Phil look so happy together, Sally. It’s wonderful to see. Happy anniversary. You two are such a handsome couple! So happy – the shot from Lisbon is just beautiful. 🙂 Congratulations on 12 wonderful years!!! I love how Phil proposed to you. I mean if you can pull off a major house project together it’s meant to be right?! Here’s wishing you many, many, many more wonderful years together. The shot from Lisbon was taken by a dear friend, GREAT photographer, who was in Lisbon with us for a weekend. We were living in Paris then, so Lisbon was a short flight away… .great opportunity for a fun trip! Having had the great pleasure of spending time with you, I think you are one of the happiest couples I know. Your mutual adoration is apparent as is your ability to understand and accept the others’ idiosyncrasies. I have learned that If the love is not strong the idiosyncrasies soon become annoyances. Joe and I are both a little crazy about certain things but we don’t let that stand in the way of our happiness. If I feel myself getting annoyed I remind myself to be grateful for the opportunity to practice patience. Congratulations to one of mt favorite writers! Congratulations on a great marriage! nice to “see” you here! Thank you! and there she is! The wife of the Lisbon photographer, in flesh and blood on the Bewitching! Great honor! You know, Marijo, one of the photos Vlad took of me (in that castle, high up, when I was scared to death to get to the edge), is one of my favorites EVER! He is such a great portrait photographer! Congratulations Sally. DH and I will be celebrating our 18th anniversary in May. So only two more months and big party for you! Wonderful! Happy Anniversary, Sally. He knew a good woman when he found one! May you have a wonderful and life together. Wonderful pictures! Thank you for sharing them. Happy Day! Thank you! We were very lucky to meet, having lived in different continents most of our lives… but, fate worked to our advantage! Indeed! You could definitely say I went through some heavy scrutiny…. The hot sun actually did not bother me that much, although the difference between the color of my back and my front after we were done with roofing was quite pathetic – I don’t think I ever got soooo tanned in my life! But the ladder, that’s another story. What an ordeal that was in the beginning! I love love love this post! You two are gorgeous together and all the photos show the passion and care that you have one for another. I wish you both good health for the rest of your lifes, to enjoy and be grateful for every minute that you’ve been given together. Wishing you many many more romantic years to come! Here is to many many more happy years full of magic. MAJOR congrats! you guys look seriously happy together which makes me seriously happy. Congratulations, one day late, Sally! I don’t comment that often, but never miss a new post, and loved this one! Echoing others, you two are the perfect picture of happiness, and form such a handsome couple! toasting to your special day! THanks, Mary…. well, after the roof, we’ve been through one full kitchen renovation, a few years later our bedroom + bathroom (that was hard…) and right now a little renovation of the small guest bathroom, but this one is cake compared to what we’ve done in the past.